1. Combine water, rice wine vinegar, salt, sugar and coriander seeds in pot and bring to a boil for 15 seconds. 2. Take off heat, add juniper berries, jalapeños and chili flakes and let stand for 1 hour or room temp. 1. Steep saffron in 1/3 cup water and let sit for 20 minutes. 2. Season chicken with salt and pepper, season the brined Shrimp with the smoked Za’atar seasoning. 3. In 18” paella pan heat canola oil to medium-high heat, add chicken and chorizo together and cook for 2.5 minutes. 4. Then add prawns and cook for another 3.5 minutes or until chicken has browned and prawns are tender. Remove prawns and set aside. 5. Add paprika, garlic, onions, bay leaves and tomatoes to pan and cook over medium heat for 5 minutes, onions will have become translucent. 6. Then add saffron mixture and stock to pan and bring to a boil. 7. Add rice and evenly distribute in pan so as not to clump (do not Add the peas, peppers and artichokes and cook for 14 minutes, most of the liquid will have been absorbed. 8. 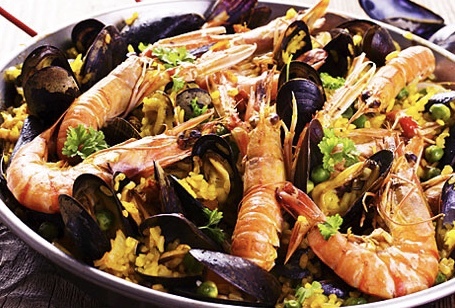 Reduce heat to low, add mussels and prawns and cook till mussels shells have opened or about 8 minutes (do not stir) liquid should have been absorbed. 9. Cover with top or aluminum and let sit for 5 minutes before serving.